Was it Charles Dickens who started one of his novels, ‘It was the best of times, it was the worst of times’ ? Well this year has been a bit like that for me! The best ‘Art’ year I’ve ever had, starting with excellent sales at the Geedon Gallery, followed by my solo show at the Naze Tower gallery, and excellent sales at Essex Women Artists exhibition at the Haylett’s Gallery, and then a really fun couple of weekends for Open Studios, with some private picture sales happening all through the year – all good. The cancer diagnosis, and major op in the autumn – not so good. But I am completely cured now, and really looking forward to 2017. My ’12 Months in an Essex Wood’ project this year has been hugely rewarding, and I feel I have really made solid progress with it. Of the ten large paintings I have completed so far, I have already sold five, and plan to have the last two on show at Lexden Arts Festival this year. 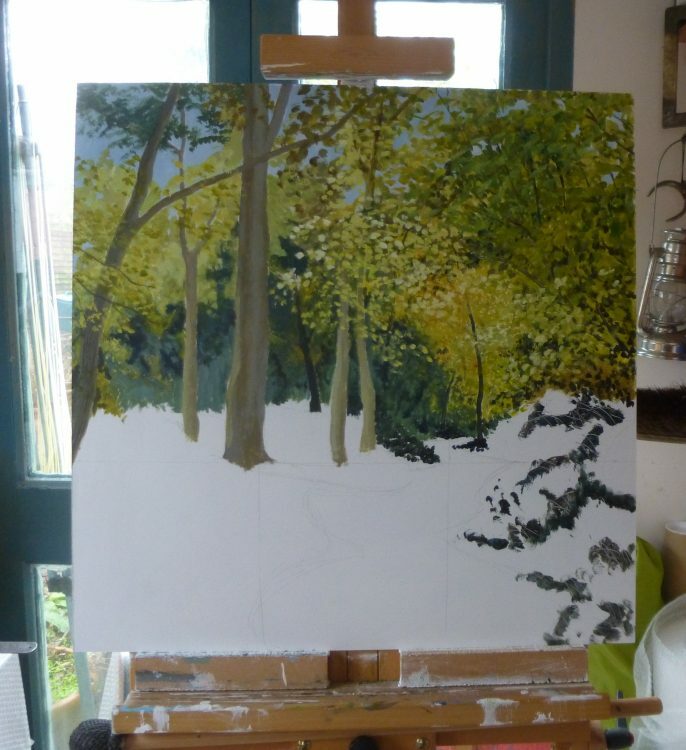 I am making progress with Essex Wood: November – this is how far I’d got yesterday afternoon. I have plans for a lovely new project for next year, as well as some other exciting ‘arty’ plans which I will share tomorrow.